Psypoke - View topic - What's your favorite game? Re: What's your favorite game? For PS1 I liked Alundra and for the Computer I loved playing Black and White. Those were fun games. Black and White was a tough game though. 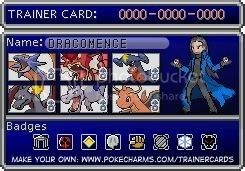 Credit to Mektar:AWESOME Trainer Cards. I have a few favorites. The ones I like the most are fallout 3, fable 2, Metal gear solid 4, and Zelda: ocarina of time (I forgot the exact name, don't kill me ;_;). There are probably more though. Last edited by Lawence Codye on Sat May 22, 2010 3:18 pm, edited 1 time in total. Edit: I cant believe I forgot Fire Emblem Radiant Dawn! My top ten would have to be. "The darkness needs the light just like the light needs the darkness. For without one the other would perish." Location: In a galaxy far far away. Halo series!!! Although I havent played any of the new ones (3 and on) but the other two are fun! I like games were you kill things in general. MGSPW2 is actually a demo. I hope the full version comes out soon. 3. pokemon too, blue was my fav. Plenty more games im not going to name at the moment. Last edited by AnimeFreak_98 on Mon Jul 19, 2010 6:09 am, edited 2 times in total. Umm... are you sure you aren't looking at the first post? Age of Empires 2. Nothing beats it. Nothing. Although I also like the GTA series. I focus mostly on Fighting Games. But I'm not too fond of FPS, Racing, or Simulation games. P.S. How do you put a picture of your trainer card and the pokemon in your party???? Both #1's are just too awesome. I couldn't decide if I tried. All the games I've mentioned hold a special place in my heart. Thanks to Ender for the sig!